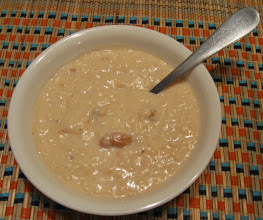 Place milk and rice in a 5-6 gallon crockpot and cook for 4-5 hours on high or for 8-10 hours at low heat. Add sugar, cardamom powder, and saffron, then mix well. Heat ghee on medium heat, add cashew nuts, stir until lightly browned, add raisins and stir for 2 more minutes, then add to the pudding.